HBF Textiles has partnered again with designer Elodie Blanchard to create an encore collection of textiles which translate the intrinsic beauty of nature through pattern and texture. Inspired by Russel Wright’s organic modern architecture, the designs celebrate the extraordinary elements of the natural world, from the softness of clouds to the intricate detail of a butterfly wing. 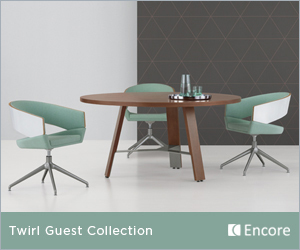 Filled with soothing neutrals and vibrant new hues, the series has the ability to be used in multiple applications from wrapped panels to systems panels to upholstered seating. 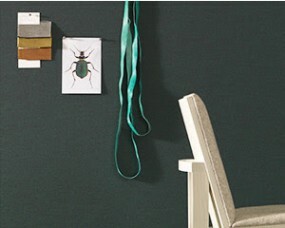 Beetle – a visually luminous fabric with a subtle metallic sheen reminiscent of jewel toned beetle carapace. A bleach cleanable fabric with 80,000 double rubs abrasion resistance, Beetle is approved for wrapped panel/system panel and upholstery applications. 11 coloways at $44/yard: Rhino, Tortoise, Bark, Ladybug, Stag, Clown, Longhorn, Jewel, Emerald, Rice and Patent. Butterfly – an homage to Blanchard’s large scale abstract butterfly installations at ABC Carpet and Home, Butterfly becomes a detailed interpretation of the multi-colored stitched yarns intertwined and interpreted through a jacquard woven construction with 100% Eco-Intelligent antimony-free polyester. NSF 336 Gold rated with a stain resistant finish, Butterfly’s 100,000 double make it suitable for both wrapped panel/systems panel applications and upholstery. 8 coloways at $38/yard: Moth, Tortoise Shell, Lacewing, Monarch, Periander, Aqua-blue Swallow, Colombia and Acadian Hairstreak. Cloud – developed to bring coziness and a feeling of protection to the office. Made of a matte lasse construction with a cross dyed stuffer pic, Cloud is a bit surrealist, transporting us to a softer, gentler environment. With a NSF Gold rating and stain resistant finish, Cloud passes the ASTM E-84 for an unadhered wrapped panel application as well as a dynamic tufted upholstery. 7 heavenly colorways at $55/yard: Winter, Summer Autumn, Evening, Midnight, Dawn and Twilight. 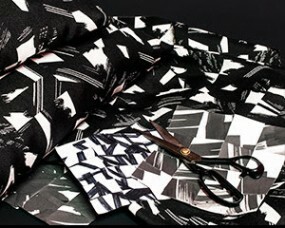 Cut Out – Inspired by the paintings of Franz Kline and Barnett Newman, Blanchard created the pattern by painting a black and white abstract expressionist composition and then cut the painting into rectangles and shuffled the pieces until she found a good balance between positive and negative space. 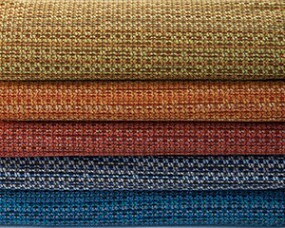 Woven with Sunbrella outdoor yards and bleach cleanable, Cut Out’s primary application is for indoor/outdoor seating applications supported by a superior lightfastness and NSF 336 Silver ratings and 100,000 double rubs for heavy duty performance. 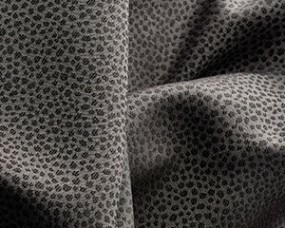 5 colorways at $60/yard: French Grey, Persian Rose, Ultramarine, Pearl Grey and Mars Black. Gravel – an interpretation of an organic pointillist pattern of a pebbled seashore, Gravel is made with 61% post-consumer recycled polyester and 7% pre-consumer recycled polyester content and approved for both vertical and seating applications. Another heavy duty performance material, the fabric comes standard with a stain resistant finish, NSF 336 Gold rating and has passed the ASTM E-84 flame test with a class A for both wrapped panel and systems panel applications. 5 colorways at $34/yard: Quartz, River Rock, Shale, Soapstone and Basalt. 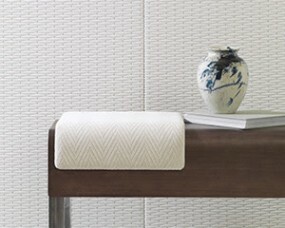 Peak – a pixelated modern interpretation of landscape wallpaper found on a typical computer screen saver, Peak mixes two Eco-Intelligent, Antimony free polyester yarns and a variety of weave structures. This heavy duty performance fabric has been rated: NSF 336 Gold, class A on the ASTM E-84 unadhered flamed test and is suitable for wrapped panel/systems panel and upholstery. 7 colorways at $38/yard: Crest, Dessert, Canyon, Waterfall, Glacier, Volcano and Ridge. HBF Textiles gives dimension to the lives and spaces of users, designers and communities through the essential qualities of fabric. Our expertise comes from understanding the inherent qualities of fabric—yarn, dyeing, spinning, structure and weave. What we produce is not just textiles, but a larger web of relationships. Weaving textiles together with manufacturing and production, we are part of a two hundred year old legacy of textile manufacturing within North Carolina. And, with like-minded mills and collaborators––locally and globally––we explore together the myriad of possibilities of what fabric can be. 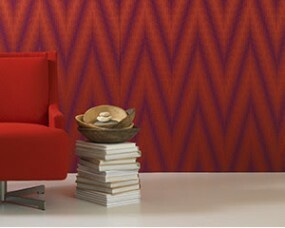 Visit us at: www.hbftextiles.com. Elodie Blanchard began designing clothes and organizing fashion shows in her teens before moving to Paris to study sculpture at the École des Beaux-Arts and fashion at the Duperré School of Design and Fashion. In 1999, she won the young designer prize at the International Fashion Arts Festival of Hyeres, which gave her the opportunity to sell her eponymous clothing line at the famed French La Redoute store. After studying at CalArts in Los Angeles, her interests expanded to performance projects, including collaborations with musicians and dancers. Later, Blanchard delved into a variety of endeavors including prototype product development, trend forecasting, special event design, and costume and set design. She has also taught at Parsons in NY. 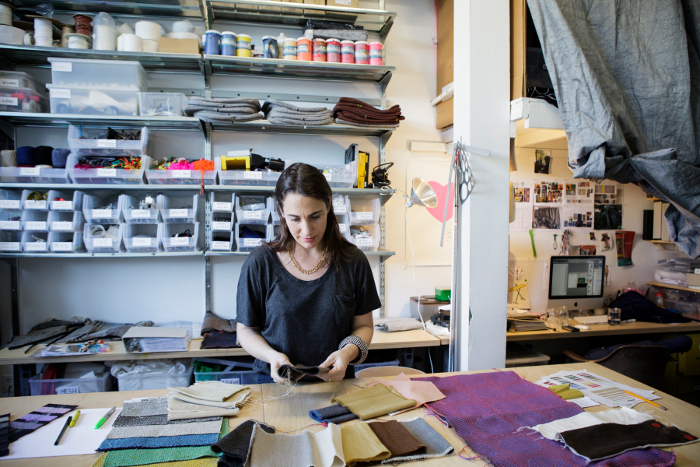 She has since founded Elodie Blanchard Studio specializing in textile design and fabrication. Her aesthetic is modern and whimsical: each unique piece showcases her ability to take everyday objects – an heirloom quilt, a utilitarian moving blanket, a favorite pair of pants – and transform them into extraordinary textiles with diverse design applications. 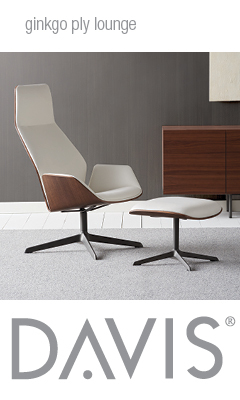 In 2014, she collaborated with HBF Textiles, winning the gold award at Neocon. Blanchard’s work has been featured in The New York Times, New York Magazine, Fortune, Metropolitan Home, Interior Design, DWELL, Domino and ELLE Decoration among others.